Khrystyna Yehorova, a student from Ukraine, spends much of her spare time engaged in school and community service projects in her Tulare, CA community. In January alone, Khrystyna completed 31 hours of service. From collecting money for Hurricane Sandy survivors and distributing food to the homeless, to responding to Santa letters for local elementary school children-- Khrystyna has experienced the benefits of helping others. 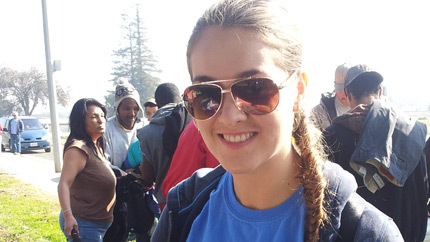 "Volunteer work was a new experience for me," admits Khrystyna. "Americans are willing to help each other. That's how my American experience changed me. I learned to see things that I never noticed before. I became a new person ready to do something good and helpful for people." Khrystyna was able to travel all over the U.S. and says she had "no time" to be homesick. "Don't waste time on being homesick; it's not fun," says Khrystyna. "Make a lot of friends in school and be friendly to everybody--people like when you smile. Be active in school, do a sport, be involved in your local community and don't be afraid to ask questions, because Americans will always help, they care about you." "My host family is so nice. They opened the door in their house to give me such a wonderful opportunity to get to know American culture. I appreciate what they are doing for me. It's amazing how fast people can be attached to each other." "The most memorable experience for me was visiting Washington, D.C. and Disneyland--two places that I will never forget. The most amazing days in my life I spent in these places. In Washington, D.C. we had a competition for all foreign exchange students all over the U.S. It was called the Civic Education Workshop. Just 100 students went on this trip and I won the competition!" "We visited a lot of beautiful places like the Washington Memorial, Jefferson Memorial, Lincoln Memorial, Capitol Hill, and the Supreme Court. We had meetings with congressmen and senators. I learned a lot about American government and its role in country. I found it very interesting and so different from my country." Because of her FLEX program experience, Khrystyna now believes she can effect change. She hopes to take the lessons she's learned in America back to her home country. "I think visiting Washington was the most memorable experience in whole my life," says Khrystyna. "While in America I came to the conclusion that the U.S. has a strong democracy, freedom, and equality. The U.S. and Ukraine are a lot alike but citizens of the U.S. are influencing the legislature a lot. It helps to keep them informed and involved in what is going on in the county. My country has a great potential for a better future. We need leaders; we need new ideas, so that our youth will believe in it and they will help bring new changes in our society."